While sailing the seven seas Captain Jack was caught in a wicked storm that sent his ship crashing into the rocks off Coral Island. Stranded with nothing but the shipwrecked remains of his beloved galleon, Captain Jack set about building a Bar and Grill where he would sell dishes he had discovered on his voyages. 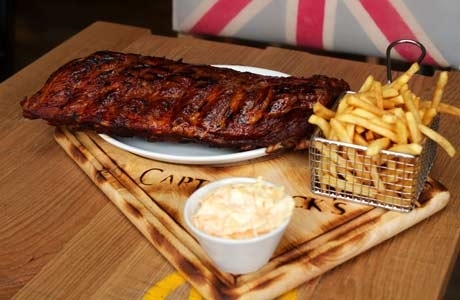 Captain Jacks Bar and Grill is now famous far and wide for his Double Dipped Wide Ribs glazed with a choice of BBQ , Jack Daniels or Hot and Spicy sauce, they are so finger licking good you may have no fingers left. Or if its burgers that float your galleon then you need look no further Jacks stacker burgers are layered with fresh succulent ingredients and loaded with classic burger sauces. Maps at the ready… you will find Captain Jack’s at the front of Coral Island on Blackpool’s fine promenade looking out over the sea. Scallywags be more than welcome at Captain Jacks, KIDS EAT FREE in all our Coral Island restaurants, Jack has devised a great Kids activity menu to keep everyone happy. A pram shed has been built to store all those buggys so you have more room to enjoy the fabulous restaurant Captain Jack has created. KIDS EAT FREE - All day, every day in all restaurants, one free under 10 kids meal per paid adults meal. One child must be present per free kids meal claimed.